The covers will come off the 2020 Mercedes GLC facelift at Geneva next week. As we learned last week, Mercedes will be revealing lots of new models at the Geneva Motor Show next week. One of the most important, however, will be the arrival of the new 2020 GLC Facelift. Ahead of its world debut, Mercedes has released a new teaser video on Facebook giving us a first look at the updated premium SUV. The short video shows the SUV driving through a river, but we only get a fleeting glimpse of its redesigned front fascia. Compared to the current model, we can see the 2020 GLC will feature new headlights with revised LED daytime running lights. 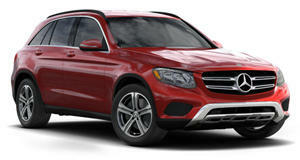 It also adopts a new grille with two horizontal slats compared to the one found on the current GLC, as well as a more rugged-looking bumper featuring a more prominent front guard. We’re also expecting the taillights to get a revised design. Other than that, changes to the overall shape will be minimal since Mercedes won’t want to risk messing with the compact SUV’s successful formula. Inside, the 2020 GLC should get the same updates as the facelifted C-Class, including a 12.3-inch fully-digital instrument display and a 10.25-inch infotainment system with the automaker’s advanced MBUX operating system. Engine options should also carry over from the C-Class facelift, including a turbocharged 2.0-liter four-cylinder with 255 hp and 273 lb-ft of torque. More details will be revealed next week when the 2020 Mercedes GLC makes its world debut at the Geneva Motor Show. At the show, Mercedes also will be lifting the covers off the new CLA Shooting Brake and revealing a new electric concept called the EQV. In addition, three special-edition models will be on display including the S65 Final Edition, which will mark the end of AMG's 6.0-liter twin-turbo V12 engine being used in the S-Class. Mercedes made a huge leap forward with the GLC and now adds a plug-in hybrid option, but the hybrid powertrain disappoints.